Introducing the Contender™ Post-Op Elbow Brace, an orthosis that brings innovation back to bracing. 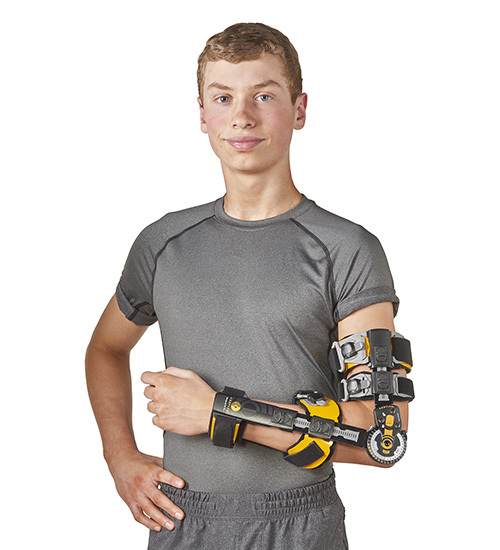 Simple and precise ZipTrak™ adjustment system minimizes fit time while the aluminum humeral, forearm and wrist cuffs are easily contoured by hand to provide a secure fit and help limit brace migration. The Contender is also the only post-op elbow brace with a removable biceps cuff that helps avoid incision site irritation while promoting greater flexion range at the elbow. QuikZip™ Buckle System enables one-handed application and fabric-covered compression molded pads help eliminate pressure points and ensure maximum patient comfort and compliance. Padded cradle-style sling is included with every brace. Sized hand attachments are available separately that allow the wrist/hand to be positioned in neutral, pronation or supination. The ROM hinge features an 11-position drop lock that fixes the brace from -10° to 90° in 10° increments. A controlled range of motion is available from -10° to 110° and is easily set using flexion and extension finger-touch buttons that can be discretely locked using our unique FlexLok™ band. Brace features an easy-to-fit closure system with trimmable straps, QuikZip™ buckles and graduated ZipTrak™ that facilitates overall length adjustment in 1/8” increments from 14” to 19½” in just seconds. Indicated for use following elbow reconstruction, ligament and tendon repairs (Tommy John surgery, distal biceps or triceps tendon repair, etc. ), collateral ligament reconstructions, elbow hyperextension, tennis elbow release, stable or internally fixed fractures of the distal humerus or proximal to middle radius or ulna or mild to severe soft tissue injuries. Constructed of aircraft-grade aluminum uprights, aluminum, and nylon cuffs, cross-linked high-density polyethylene foam padding; foam laminate strapping and nylon hook closures.